I attended our users group last Monday, where Jim Wooly showed us, attendees, how to create our first Analyzer using .NET Compiler Platform, formerly known as Roslyn. He posted a bunch of resources here. I wanted to document for myself the steps I took in creating an analyzer/fixer to ensure that all fields inside a class start with an underscore. I am not starting a debate on naming conventions, but it seems like a good way to experiment. First of all, I had to setup the environment. I used a virtual machine with Windows 10, though it is not a requirement. 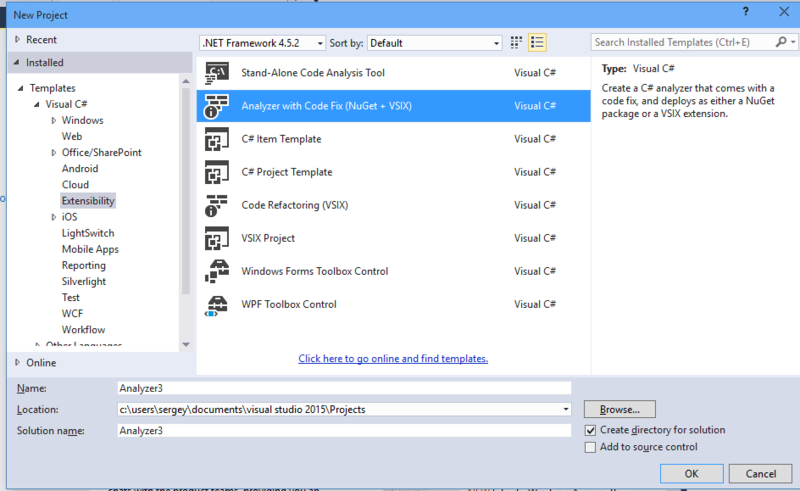 Visual Studio 2015 RC. You can download it from Visual Studio home page – https://www.visualstudio.com/en-us. I used Enterprise edition preview. Visualizer is helpful when exploring source code to decide what API classes should be used in any particular case. It is not necessary, but I had to use to write my analyzer. Now the steps to create your first analyzer. The solution will contain three projects: actual analyzer, tests and VSIX. VSIX is the actual deployable Visual Studio plug in you can post on Visual Studio gallery for example. The code in the analyzer is trivial, ensuring that class names are in all upper case. Now I am going to change the code. First, the analyzer. I am going to look for Field declarations and check for variable declaration names. I want to check to see if they start with an underscore. There are two steps I need to take. First of all, I want to register for notification of specific symbols, field declaration symbols. I can do this in Initializer method of my class, which inherits from DiagnosticAnalyzer. Then I have to write the code to check the names and display a specific message. This is done in the method passed to register call above – AnalyzeSymbol. // For all such symbols, produce a diagnostic. This is it. One thing Jim pointed out is that the code inside AnalyzeSymbol method must be very fast, as it will be called many, many, many times. Because we registered to be only notified for field symbols, we can safely cast passed in Symbol to IFieldSymbol. Now, we need to write the fixer code. Ideas again come from generated sample project template. One super cool feature included in magical Renamer class. It will help us simply fix the symbol name without having to manually hunt down all the instances. Fixer is a separate class, inheriting from CodeFixProvider. FIrst we have to tell Visual Studio what diagnostics we can fix. In our case, previously defined underscore diagnostic. Next, we have to register the fix, including the message we want to show to the coder. // Get the symbol representing the type to be renamed. // Produce a new solution that has all references to that type renamed, including the declaration. // Return the new solution with the now-uppercase type name. Now, we need to write tests, because it is much easier that live debugging. Again, I am using generated code as guidelines. Mainly, I just create source code text that contains an issue, then call analyzer and fixer, then verify corrected code. For final tests, I am building the VSIX project, third project in the solution, then importing generated .vsix file, finally writing a sample class that contains an issue I am troubleshooting, verifying that my analyzer and fixer still works. It does! You can download solution here. This link doesn’t work anymore. @existen You can find everything you need to get started at https://github.com/dotnet/roslyn now.